I wanted to do a contemporary tapestry and wanted to use the following stencil from Melanie Royals collection one last time. I have used it so much that I need to retire it for a while. Famous last words I know! First step was rolling on Modern Masters Reactive Metallic Paint in Bronze. After it dried I randomly sprayed MM Patina on the canvas. Stenciled the design with various coppers and turquoise. Then used mica powders in various areas and fine copper glitter for the big flower designs. Added some dangle beads to the bottom. 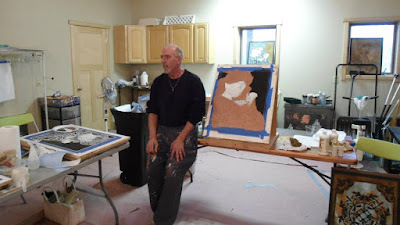 To hang the canvas I spray painted a dowel copper and then used some turquoise to give it a patina look. The finished canvas below. This tapestry was very fast and fun to do. Since I am going to put this stencil away for a while, I need to replace it. Give me a suggestion for a stencil at least 20' and I will use it for 4 different finishes. Canvas, tapestry, wall and either a floor or counter top. Thanks for the how to! I loved this when I saw you post it on FB. Rarely do I see artwork that I can say definitively that I want it... I WANT IT! Really great inspiration and kudos to Melanie too, because I'm about to purchase that one! Thanks Kathy!! Beautiful eye for design! I love this! Now all I need are all of the products to do the project.